The Wavesport Fuse 48 is a river runner/playboat cross, often compared to the Jackson 2Fun but generally seen as a little more forgiving and a bit less aggressive. I demo’d the Fuse for about 6 weeks recently and it really grew on me. I’m giving it two thumbs up as a beginner to intermediate whitewater boat, and a great one to have if you want one kayak that gives you the option to play on waves and also move up to some Class IV whitewater. 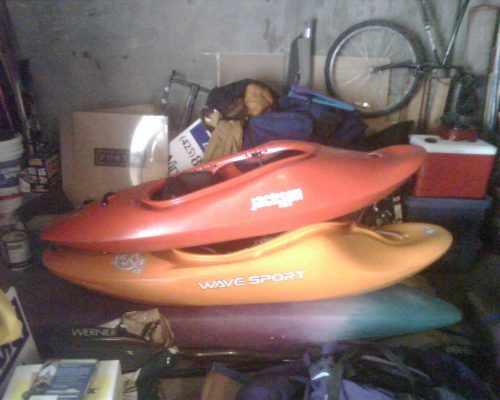 I can see how people develop a quiver of whitewater kayaks. I took the Fuse mainly on the Skykomish River, on the Class III-IV Cabledrop to Split Rock run that includes Boulder Drop. Here’s my take on it. The Wavesport Fuse is an extremely forgiving boat, which is why I think it would be a great beginner boat – mainly because it’s also short enough to let you surf as well, so you get the benefit of a solid river runner without missing out on learning how to play. People talk about the ‘secondary stability’ of the Fuse, meaning a kind of second chance you get to not flip over. 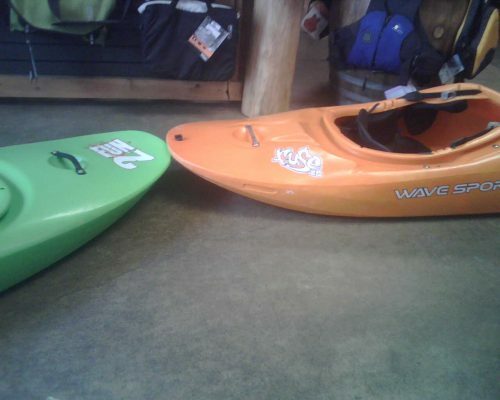 I LOVE Wavesport outfitting! Some people say they either fit you or they don’t, but I know someone who’s built very differently than I am, tall and leggy (her, not me) and she loves the Fuse outfitting too. The knee pads are on runners and really adjustable, and the seat is just plain comfortable. I’m not an expert surfer, but I did also take the Fuse on the Wenatchee and spent some time at Turkey Shoot with it. I feel like between the two, the Jackson 2Fun is a bit easier to surf because the edges seem to release a little more easily, and I’ve heard that from some other people as well. However, I got some really nice surfs in on the Fuse and I know some good paddlers who love the Fuse as a surf boat. Are you kidding? I really can’t do tricks at this point. Overall the 2Fun will offer more options in this area because the stern is slightly shorter and has less volume, however I’ve seen videos of good playboaters doing all kinds of crazy stuff in the Wavesport Fuse. I do know that when I first got the 2Fun I did stern squirts on the first day and I was not able to do them in the Fuse, but again I think that’s partly because I got worse at doing stern squirts for some reason. On a scale of 1 to 10, I give the Wavesport Fuse an 8 or 8.5 for rollability, and the Jackson 2Fun a 9. (The 2Fun is so easy to roll I’d give it a 10, but someday they might make a boat that rolls itself and I’m saving the 10 for that.) The secondary stability of the Fuse that I talked about appears to also provide just a tad bit more resistance on the way up, but it’s really negligible, and I’d classify both boats as very easy to roll. 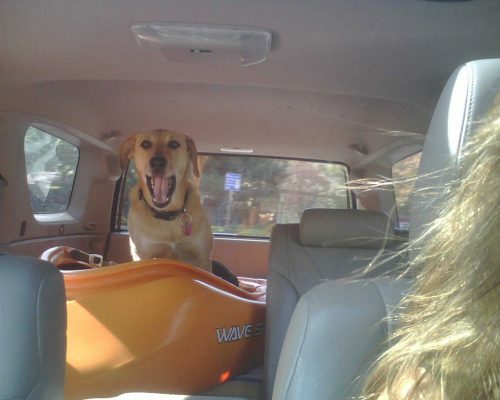 On to Libby’s review of the Wavesport Fuse. 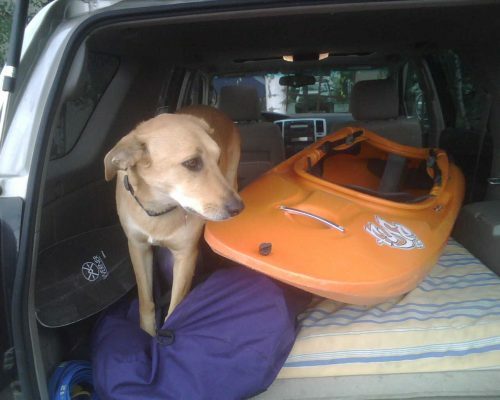 Libby’s OK with the Wavesport Fuse, although for some reason she seemed more at ease overall in the Jackson 2Fun. 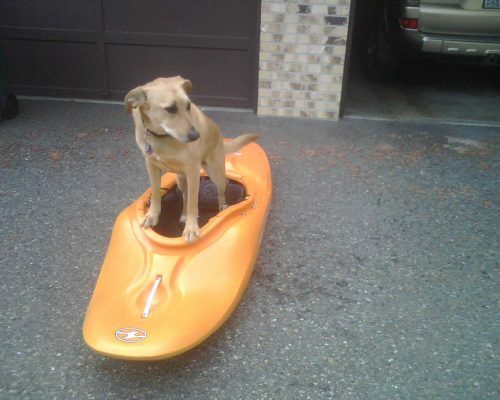 Libby demonstrates the admirable stability of the Wavesport Fuse. 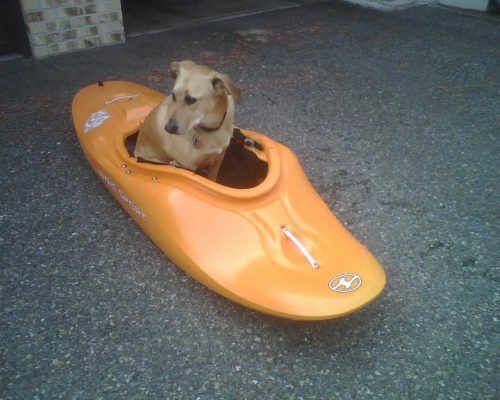 She does find it pretty easy to maintain the correct moderately aggressive kayaking posture in the Fuse. Ooo, big hole on river right! And size-wize, another great thing about the Fuse as compared to a 40 lb river runner like my first boat, the Necky Jive, is that it’s easy to carry and there’s plenty of room to stick it in the car. Overall, I really like the Wavesport Fuse 48. When I was flipping all over the place in the 2Fun (again, after I messed up the outfitting) I had a lot of people tell me I should stick with the 2Fun because it was the more challenging boat and would make me grow faster. I tend to think along those lines anyway, but then I thought, what if just for once I chose to not do something the hardest way possible? For me, the key was that when I switched back to the Fuse I ended up having more fun, and gained confidence and skill because I tried more things. I never would have tried Boulder Drop for the very first time at 2400 cfs in the 2Fun, but I felt OK giving it a shot in the Fuse, and it also made me a better roller, since after swimming twice in Boulder Drop I learned to REALLY keep my head down at the end of a roll. (Plus, the last 3 times I’ve done Boulder Drop have been in the Jackson Star, which is more squirrelly than the 2Fun – which goes to show that starting out in a slightly easier boat doesn’t necessarily hold you back.) I love the Star, by the way, just haven’t written a review on it yet. So ultimately, I’d say the Wavesport Fuse 48 and the Jackson 2Fun are both great boats – pretty comparable and good potentials for beginner boats, but the Fuse is probably an easier boat for some people starting out and leaves plenty of room to have fun and grow – I don’t see it as just a beginner boat at all, simply one that works well for beginner kayakers as well as intermediates. And it really does open up the door for kayakers with more experience to use it in more difficult whitewater, like Class IVs. Overall, a great boat – I give it two thumbs up. Libby yawns a lot in the Fuse. Not sure what that means. My Review of the Jackson 2Fun – TOO Fun! Are you sure that’s not a really big smile? Really.. I demo’d the Fun and the Fuse and found the Fuse to be a much better Play machine than that of the Fun and more stable too. I demo’d on class 4 for 3 days and it was hands down the Fuse! Anyway, goes to show different paddlers, different views. Irene…this is a really personal question that you don’t have to answer…my wife and I are looking for a boat for her. The Fuse 48 is her size but she’s also considering a Jackson Too 2 Fun. I think that she could go with the 2 fun. The question is what are your dimensions (height, weight, inseam) so that we can use them to compare? Around 5’4″, 125 – and what’s an inseam? :) Seriously, I think I’m in the mid-range for the 2Fun and the Fuse, although I’d have to look up the stats again. If she’s in the weight/height range it’s really about which boat feels more comfortable, and how comfortable she is with how the boats handle. I do think the Fuse is a bit more stable, but I love the responsiveness of the 2Fun, which in a sense makes up for it being a bit less stable, if that makes any sense. And Jacksons in general are some of the most comfortable boats for me. But Wavesport outfitting is great too. My advice is for her to demo each one if she can. Good luck!